Why Do Orthodox Christians Need Holy Fathers? Isn’t the Bible Enough? 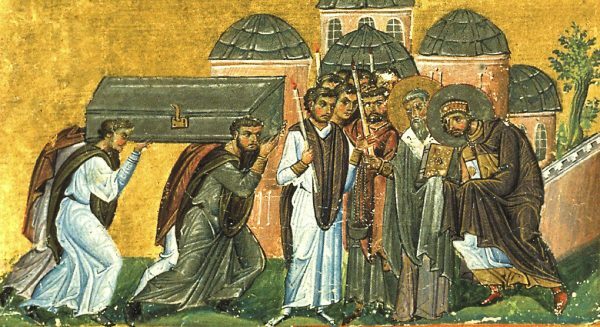 On January 27 (February 09), 438, the incorrupt body of Our Holy Father John Chrysostom arrived in Constantinople – “translated” (moved) from Armenia where he had been banished and where he had died 31 years earlier. His relics were received with honor into the imperial city where once he had been Patriarch. You can find many short quotations from John Chrysostom here. They are down to earth, humane, inspiriting, challenging. If you read only a few of them you will be edified. I guarantee. The Empress Eudoxia was now John’s enemy, and when she came to church he preached against her. He had good reason, for she had now a great statue erected to herself at the Hippodrome. The Empress and her courtiers regularly arrived late for Divine Liturgy (is thishow the Orthodox custom began?!) and went out of their way to make a great commotion coming in. John criticized them for this publicly.